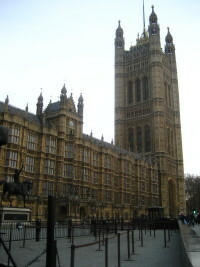 We headed over to Parliament, just down the street from Horse Guards Parade, and stopped to take some photos. The building is very ominous and ornate — the kind of thing that makes it unsurprising that Harry Potter came from a Brit’s mind. And it couldn’t be more different from anything you’d ever find in Washington, DC. 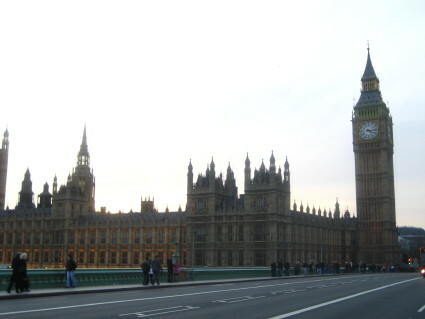 Big Ben and the Sovereign’s entrance — the other big tower — are the most impressive parts. Westminster Abbey, which is just across the street, closes pretty early on Saturdays, so we weren’t able to go in, but the outside is a bit confusing. It’s so crowded with architectural supports, additions and multicolored stone bricks that it’s hard to see it as a cohesive building. I imagine I’ll be much more impressed when I get to go inside. We didn’t get any great phots of it, so that’ll have to wait. 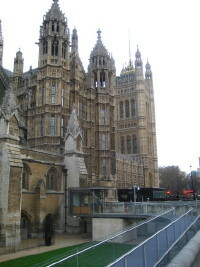 After walking down the street side of Parliament we crossed the river and checked it out from its more iconic angle, which was quite nice (see the big photo above). And we braved the crowds of tourists at County Hall on the other side of the Thames and spent some time in The Dali Experience, which was an interesting exhibit, though it seemed a bit underfunded despite its relatively high entry cost and large museum store. The art itself, though, was expectedly surreal and bizarre and sparked lots of questions. There was also a small and less impressive Picasso exhibit in the basement of the museum.